Eagles are among the most impressive hunters of the animal world. Their predatory prowess and flying skills have imbued them with a romance and mystique that runs deep in our culture and has elevated them to emblems of freedom and power across the globe. At the same time, however, people have long seen eagles as competitors. Reviled by farmers and gamekeepers as snatchers of livestock, many species have been driven into decline by persecution and disturbance. Two species of eagle occur in Britain – among 60 worldwide – and are the focus of RSPB Spotlight: Eagles. The regal Golden Eagle is the definitive 'true' eagle and occurs in wilderness areas across the northern hemisphere; the even larger White-tailed Eagle, reintroduced to the UK after historic extinction, belongs to the separate 'sea eagles' genus. These two spectacular birds are both very rare – confined largely to the remote Scottish Highlands – and a sighting of either is one of the UK's most exciting and sought-after wildlife experiences. This highly readable study looks separately at both UK eagles, exploring how each is adapted as an apex predator in its own environment, and explores the relationship between the two. Separate chapters cover all aspects of the birds' biology and lifestyle, from defending their vast territories to raising their young. Fascinating secrets are revealed, including the brutal truth behind 'Cain and Abel' syndrome. 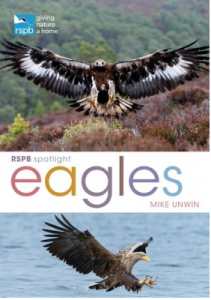 RSPB Spotlight: Eagles also takes a look at other eagles around the world, placing the two UK species within this broader context. Finally, it examines the complex relationship that humans have enjoyed with eagles since time immemorial, spanning both culture and conservation, and offers expert tips on where and how you can watch these magnificent birds for yourself.